Volvo's set to debut the S60 Concept at next month's Detroit Auto Show as a preview of what to expect out of the 2010 Volvo S60. Full scoop and early press photos below. Created as a vision of the upcoming 2010 production sedan, the Volvo S60 Concept shows off some exciting new design features indicative of the future Volvo design language most recently shown on the 2009 XC60. No longer are Volvos designed to be utilitarian safety mobiles, they now wear aggressive yet contemporary forms and the 2009 Volvo S60 Concept is no exception. The profile suggests a very coupe-like roofline reminiscent of the Mercedes CLS and VW Passat CC with a long hood and short rear deck with pronounced shoulders forming a double wave that runs the length of the car to the Viking longboat inspired, pointed headlamps. The trapezoidal grille is now larger and more pronounced while two LED ‘DNA' lamps flank either side, emphasizing the vertical stance of the front design. The previously mentioned headlamps flow delicately down from the hood and form the leading lines into the lower air intake's reverse trapezoidal forms. Out back the S60 Concept continues the flowing nature with lines that walk you around the rear instead of ending abruptly and were said to be inspired by the "fast sweeps of the racing track." The LED tail lamps follow the curvature of the rear shoulders and protrude gently off the rear body work. A retractable diffuser below adjusts with vehicle speed, giving the S60 Concept better aerodynamics and presumably better fuel economy. The interior of the Volvo S60 Concept was previewed last month and is said to preview future Volvo interior design trends. In concept form the S60 is positioned as a 4-seater, though we expect the production model will lose the twin rear buckets in favor of a rear bench capable of seating 3. The interior lines of the concept will likely translate loosely to the production car, but the rest of the show car concept features will not. Notable features of the S60 Concept are the lack of B-pillars, evidence of Volvo's increasing interest in passenger safety and visibility; a gear shifter that sits in a horizontal position when the car is in automatic mode, but can be rotated vertically when the driver selects a manual shift mode and rear doors that open using a reverse hinge, allowing for greater ease of entry and a better view of the interior for us media types. 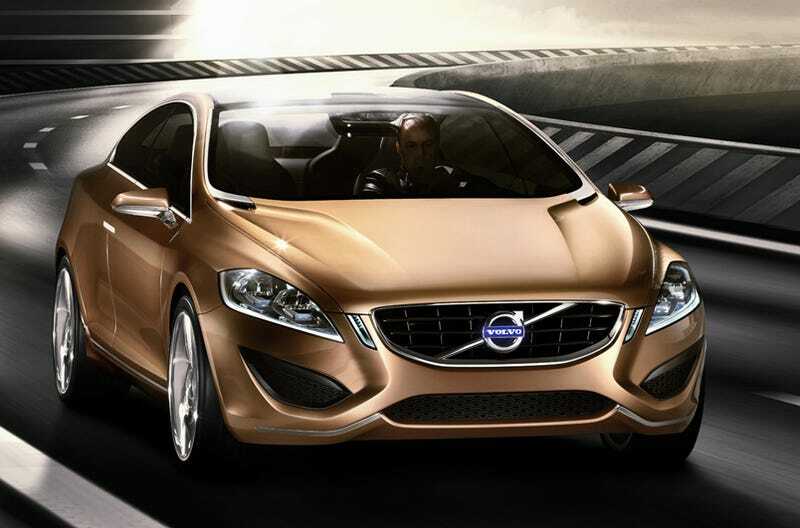 Volvo has given the S60 Concept an engine that will later make its debut in the production car. The 1.6-liter, high-efficiency GTDi (Gasoline Turbocharged Direct Injection) engine produces 180 hp and is aided by a system called Powershift, essentially a DSG twin-clutch transmission. Volvo equipped the new engine with Start/Stop technology; electric power assisted steering; ‘DRIVe-Mode' which limits the number of electrical and mechanical units being run for added fuel savings and last, but not least, a grille shutter that acts as a wind-deflecting panel to reduce drag when there is less need for cooling air. All of these features combined should add up to a combined EPA rating of 47mpg while keeping CO2 emissions under 120g/km. It wouldn't be a Volvo without some advanced safety features and the S60 Concept is full of them. The standouts are an updated Active Cruise Control system and Volvo's Collision Warning with Full Auto Brake system, both systems will make their debut on the 2010 production model. The Collision Warning system uses a camera, radar and a control unit to virtually eliminate all low-speed pedestrian collisions at speeds under 12 mph and will also apply the brakes at full power in order to reduce the impact of an emergency collision when there is no driver input detected. Our hope is that this isn't all show car wiz bang material and that the majority of the features will show up in the 2010 S60 production car set to debut later this year. Until then, enjoy our gallery of the 2009 Volvo S60 Concept. A few days before Christmas, Volvo Cars treats the automotive world to an early unwrapping of a car that will shine bright in the streets for years to come. The Volvo S60 Concept gives the car world a glimpse of what the all-new Volvo S60 is going to look like when it arrives in 2010. "The all-new S60 will be one of the strongest players in a segment where the competition is razor-sharp," says Volvo Cars President and CEO Stephen Odell. The coupe-inspired lines that gave the original S60 its characteristic stance are even more pronounced in the next generation. "The sporty design gives visual promise of an enthusiastic drive and I can assure you here and now that the all-new S60 will live up to that promise. The driving properties are better than in any previous Volvo. The car's technology will also help you to be a better and safer driver," says Stephen Odell. The concept car reveals that the Volvo Cars design team is stepping up to the next level in the development of the products' DNA.' "The concept car's exterior gives a clear indication of what customers can expect of the all-new S60. On the inside we've been even more daring - there the focus has been on creating a vision of the future in the slightly longer perspective," says Volvo Cars Design Director Steve Mattin. The front of the S60 Concept naturally sports the enlarged iron mark in the trapezoidal grille. The grille itself has a somewhat new appearance with structured horizontal vanes adding refinement to its form. Two DNA lamps that flank the grill emphasise the vertical stance of the front and promote the bonnet's V-shape. The angled headlamps flow up into the strongly sculptural bonnet. Combined with the lower air intake's reverse trapezoidal shape, this gives the concept car a very expressive "face". "Dynamic and with considerable character, but without appearing aggressive. It is packed with inspiration from Scandinavian design and from the Swedish coastline's cliffs and seas. A thrilling blend of drama and sensuality," says Steve Mattin. The concept car's headlamps unite classic Scandinavian influences with modern high-tech. In each of the headlamps, the lights create a sculpture creating the image of two miniature Viking longboats sailing side by side, one for main beam and one for dipped beam. When driving in the dark, the light is reflected from the concealed, upward-facing High Performance LED bulbs, projected ahead by the ships' filled sails. Viewed from the side, the concept car's slim coupe roofline and window graphics are accompanied by an entirely new lateral shoulder line, forming a gentle double wave. Stretching from the headlamps all the way to the tail, it adds emotional excitement and plays with the surface and its highlights. Both the seven-spoke 20-inch wheels and the tread of the low-profile tyres have been specially designed. The bronze-painted brake callipers match the "Warm Liquid Copper" livery. The unique rear parallelogram doors offer a spectacular show when they are opened and shut. Door opening is initiated by pressing on a button and the movement starts off in the traditional way. In the next phase, the forward section also swings out away from the car's body and the door glides parallel with the side of the car until it reaches its end position by the rear wheel. "In forthcoming models, you will see more and more of our "racetrack" design cues. The car's lines do not end abruptly but instead forge a continuous flow pattern inspired by the fast sweeps of the racing track. In the concept car, this is particularly visible at the rear," says Steve Mattin. The tail lamps, which follow the curve of the rear shoulders, are as advanced as the headlamps. When switched off, the lamp panels show no trace of the traditional red or yellow. But when activated, the position marker lights, brake lights and turn indicators come on in their correct colours. The solid glass panel is sectioned into horizontal "slices". At the rear there is also a retractable diffuser that adjusts with vehicle speed to give better aerodynamic properties. With the interior of the Volvo S60 Concept, Volvo Cars' design director Steve Mattin and his team are displaying a variety of spectacular next-generation ideas. "You could say that we are showing the road we would like to take in the future. This interior is without doubt the most exclusive we have ever created," says Steve Mattin. The interior is packed with exciting details, all of which together create a Scandinavian fresh light feeling, full of visual harmony. In the middle of the four-seater car glitters the jewel in the crown: a floating centre stack made out of handmade, solid Orrefors crystal. It floats like a gentle, calm wave from the instrument panel all the way to the rear seat backrest. The entire driver's environment has been designed to provide total overview and convenient control. The combined instrument too has the centre stack's floating, almost weightless feel about it. The instrument is built up in several layers. "The speedometer is designed as a three-dimensional glass spiral. The low numbers appear closest to the eye and the figures appear to be increasingly distant as you accelerate. The idea is that the speedometer should provide a visual reminder of the forward motion," explains Steve Mattin. The floating theme continues in the concept car's slim, lightweight contoured seats, made of soft Light Blond leather with contrasting stitching. The seats are attached to the centre console's lower section and inner sill, which means that they don't actually touch the floor. Both the seat belt and the armrest are integrated into the seat itself. The backrest's pony-tail slot, first featured in previous concept cars, has a new, slightly asymmetrical design. "The aim is to create a pleasant living-room atmosphere with gentle, invisible transfers between the various surfaces. For instance, the dark, ecologically tanned saddle leather on the floor continues up on the lower part of the door," relates Steve Mattin. The upper part of the doors is faced with genuine blond birch wood of the same colour as the Scandinavian coastline's salt- and sun-bleached wooden piers and driftwood. Two parallel slits create a wave-shaped protrusion whose upper section forms a comfortable leather armrest. The S60 Concept also presents a ground-breaking safety innovation that, among other things, can detect a pedestrian who steps out into the path of the car - and the car's full braking power is automatically activated if the driver does not respond to the danger. The technology, Collision Warning with Full Auto Brake and pedestrian detection, will be introduced in the all-new Volvo S60. "Up until now, we have focused on helping the driver avoid collisions with other vehicles. Now we are taking a giant step forward with a system that also boosts safety for unprotected road-users. New sensor technology also makes it possible to advance from fifty percent to full automatic braking power. To our knowledge, none of our competitors have made such progress in this area," explains Thomas Broberg, safety expert at Volvo Cars. The car's speed is of considerable significance to the outcome of a collision with a pedestrian. If speed drops from 50 km/h to 30 km/h, the chance of a pedestrian's survival dramatically increases. "Our aim is that this new technology should help the driver avoid collisions with pedestrians at speeds below 20 km/h. If the car is being driven faster, the aim is to reduce the impact speed as much as possible. In most cases, we can reduce the collision force by about 75 percent," says Thomas Broberg. This technology is also highly beneficial in the event of rear-end impacts with other vehicles. Studies indicate that half of all drivers who drive into another vehicle from behind do not brake prior to the collision. In such cases, Collision Warning with Full Auto Brake can help entirely avoid a collision if the relative speed difference between the two vehicles is less than 25 km/h. In an emergency situation, the driver first gets an audible warning together with a flashing lightin the windscreen's head-up display. In order to prompt an immediate, intuitive reaction, the visual warning is designed to look like a brake light coming on in front. If the driver does not respond to the warning and the system assesses that a collision is imminent, the car's full braking power is activated automatically. The main aim is still for the initial warning to be sufficient for the driver to brake or manoeuvre away from the hazard. Full automatic braking is an emergency measure that is only activated when the collision is imminent. Volvo Cars' Adaptive Cruise Control (ACC) has now been upgraded with a queue assist function. The radar-based Adaptive Cruise Control maintains the set time gap to the vehicle in front all the way down to standstill, making this comfort-enhancing system usable in slow-moving queues with repeated starting and stopping. The engine that Volvo Cars has chosen for the Volvo S60 Concept is a four-cylinder 1.6-litre petrol unit using high-efficiency GTDi (Gasoline Turbocharged Direct Injection) technology and producing 180 horsepower. In a conventional petrol engine, fuel is injected into the inlet manifold ahead of the inlet valves. With direct injection, however, the fuel is injected directly into the combustion chamber under high pressure. The engine in combination with a range of other technical measures makes it possible to cut carbon dioxide emissions to 119 g/km (5.0 l/100 km). Volvo Cars' first production car with GTDi technology will be introduced during the second half of 2009. Stratified combustion. The combustion chamber is designed such that a mist consisting of the optimal blend of air and fuel is formed around the spark plug, surrounded in turn by pure air. This allows the engine to operate with a surplus of air, thus cutting fuel consumption. Start/stop, a functionality that switches off the engine when the car is at a standstill. Powershift. Two manual gearboxes work in parallel, each regulated by its own clutch. EPAS (Electric Power Assisted Steering). In principle an "electric servo" where the conventional hydraulic pump has been replaced by an electric motor. "DRIVe-Mode". Gives the driver the possibility of reducing fuel consumption via an "economy mode" that limits the function of a number of selected electrical or mechanical systems. Grille shutter. A wind-deflecting panel that can be closed to reduce air drag when there is less need for cooling air. The use of lightweight materials in the car body. This engine in combination with a range of other technical measures makes it possible to cut carbon dioxide emissions to 119 g/km (5.0 l/100 km). In a conventional petrol engine, fuel is injected into the inlet manifold ahead of the inlet valves. With direct injection, however, the fuel is injected directly into the combustion chamber under high pressure. This technology promotes better gas flow with optimised air/fuel mixture and greater resistance to uncontrolled combustion. The result is higher power and lower fuel consumption. GTDi technology combined with turbocharging makes it possible to reduce engine displacement with maintained performance, but with about 20 percent lower fuel consumption and CO2 emissions. "GTDi technology is an important CO2-cutting technology for petrol engines. In the S60 Concept we have also added a number of other developments that further reduce fuel consumption. Several of these features will make their way into our production models in the coming years," says Derek Crabb, Vice President Powertrain at Volvo Cars. Start/stop, a function that switches off the engine when the car is at a standstill. Powershift. Two manual gearboxes work in parallel, each regulated by its own clutch. Since there is no interruption in torque delivery, gearchanges are instantaneous and the efficiency rating is higher. EPAS (Electric Power Assisted Steering). In principle an "electric servo" where the conventional hydraulic pump has been replaced by an electric motor linked directly to the steering system's gear rack. "DRIVe-Mode". Gives the driver the possibility of reducing fuel consumption via an "economy mode" that limits the function of a number of selected electrical or mechanical systems. This may for instance include the air conditioning, cruise control or automatic transmission gearchanging settings. "Several of these solutions can deliver significant CO2 reductions in the future since they can be used throughout large sections of the model range. When it comes to "DRIVe-Mode", for instance, the driver can actively cut fuel consumption by reducing the function of certain comfort systems. The idea is that every owner can individually choose which systems he or she wants to limit," says Magnus Jonsson, Senior Vice President, Research & Development at Volvo Cars. Volvo Cars is now introducing the next generation of preventive safety technology. Collision Warning with Full Auto Brake and pedestrian detection reacts when a pedestrian walks out in front of a car - and will activate the car's full braking power if the driver does not respond to the danger. This groundbreaking innovation is being presented in the Volvo S60 Concept, which is being unveiled for the first time at the Detroit Motor Show in early January 2009. This safety innovation is the next step in Volvo Cars' continuous development of technologies that detect dangerous situations and that actively help the driver avoid an accident. "This technology helps us take an important step towards our long-term vision of designing cars that should not crash. Our aim for 2020 is that no one should be killed or injured in a Volvo car." Within the EU, the proportion of pedestrians figuring in overall traffic fatalities varies in between 10 and 25 percent depending on country. In the EU countries' capital cities, 1,560 people died in road accidents in 2007. Of these, 43 percent were pedestrians. The speed of the car involved in a collision with a pedestrian is of considerable significance to the outcome of the accident. Lowering the speed will help dramatically to reduce the risk of serious injury to the pedestrian. If speed drops from 50 km/h to 30 km/h, the chance of a pedestrian's survival dramatically increases. "Our aim is that this new technology should help the driver avoid collisions with pedestrians at speeds below 20 km/h. If the car is being driven faster, the aim is to reduce the impact speed as much as possible. In most cases, we can reduce the collision force by about 75 percent," says Thomas Broberg. This technology is also highly beneficial in the event of rear-end impacts with other vehicles. Studies indicate that half of all drivers who drive into another vehicle from behind do not brake prior to the collision. The main aim is still for the initial warning to be sufficient for the driver to brake or manoeuvre away from the hazard. Automatic braking is an emergency measure that is only activated when the collision is imminent. In such cases, Collision Warning with Full Auto Brake can help entirely avoid a collision if the relative speed difference between the two vehicles is less than 25 km/h. Collision Warning with Full Auto Brake and pedestrian detection consists of a new, state-of-the-art dual-mode radar unit integrated into the car's grille, a camera behind the inside rear-view mirror and a central control unit. The radar and camera continuously monitor the road in front of the car. The radar's task is to detect objects and measure the distance to them. The camera's function is to determine what type of objects they are. The function is programmed to respond to cars in front that are at a standstill or moving in the same direction. Thanks to the state-of-the-art radar, which has a widened field of vision, the unit can also detect the moving pattern of a pedestrian. "We've been working on this technology for ten years now. We have had test cars out on the roads for several years and we've driven in many different countries Factors like traffic scenarious, road conditions and climate should be considered in the design of the final system. We can also use the information from these tests to make advance computer simulations, to test and verify the system in different scenarios" says Thomas Broberg. In an emergency situation, the driver first gets an audible warning together with a flashing light in the windscreen's head-up display. In order to prompt an immediate, intuitive reaction, the visual warning is designed to look like a brake light coming on in front. If the driver does not respond to the warning and the system assesses that a collision is imminent, the car's brakes are applied with full braking power. "Active brake activation requires that the object is confirmed by both the radar and the camera. Thanks to the state-of-the-art sensors, it is now possible to engage full braking power. We are among the very first in the industry to achieve this," explains Thomas Broberg. The system is built along the same principles as the human eye and, just like our own eyes, vision is impaired in the dark and in poor weather. Volvo Cars' Adaptive Cruise Control (ACC) has now been upgraded with a queue assist function. The radar-based Adaptive Cruise Control maintains the set time gap to the vehicle in front all the way down to standstill. Since the previous version was not active at speeds below 30 km/h, this means that this comfort-enhancing system becomes usable even in slow-moving queues with repeated starting and stopping. It should be emphasised that the upgraded ACC has been developed to enable comfortable driving with an automatic gearbox in normal circumstances. Collision Warning with Full Auto Brake and pedestrian detection and the upgraded Adaptive Cruise Control will be introduced in the all-new Volvo S60 in 2010.